Following the recent unveiling of the 1 Series M Coupe, BMW has now revised the 1 Series Coupe and Convertible ranges with a range of modifications and upgrades. CO2 has been lowered across the range with the 118d now emitting 118g/km while all 2.0-litre petrol versions have CO2 emissions of 155g/km or below. The revised models go on sale in March 2011, with prices starting from £21,960 for the BMW 118d ES Coupe and £24,245 for the 118i ES Convertible. Exterior changes include a new front bumper with redesigned fog lights plus redesigned halogen headlights with an 'eyebrow' element. When xenon headlights are specified this 'eyebrow element features an LED illuminated light bar. At the rear the headlights have also been changed with a more detailed appearance. However, the greatest change to ES, SE and Sport models is that they now come fitted with an Aero Curtain - a feature that channels the airflow around the front of the car to reduce aerodynamic drag, resulting in increased efficiency. Wheel arches are one of the main areas of aerodynamic drag and the Aero Curtain is BMW's innovative solution to reduce this inefficiency. Derived from race technology, air is routed into two ducts in the front apron which then flows out of a narrow opening at high speed in the wheelarch. This jet of air effectively covers the side of the front wheels like a curtain and thus reduces turbulence. As a result, CO2 emissions have been lowered throughout the range, with the 118d now rated at only 118g/km, while all 2.0-litre petrol versions have emissions of 155g/km or below. As with all BMWs, the 1 Series Coupe and Convertible also come with a raft of other EfficientDynamics measures: Auto Start-Stop is fitted to all petrol and diesel models (excluding versions with automatic transmission), while diesel particulate filters, brake energy regeneration, electric power steering (excluding the 135i), intelligent alternator control and optimum shift indicator for manual models are all standard throughout the range. All BMW 1 Series Coupe and Convertible ES models come as standard with 16-inch alloy wheels, Dynamic Stability Control, halogen headlights, MP3 playback capability and rear seat easy access system. Sport models have 17-inch star-spoke alloy wheels, Sport multi-function leather steering wheel and front Sport seats - almost £1,200 worth of equipment that is currently offered for no additional cost over an ES model. SE models get rear Park Distance Control (PDC), front fog lights and automatic air conditioning with two-zone control. 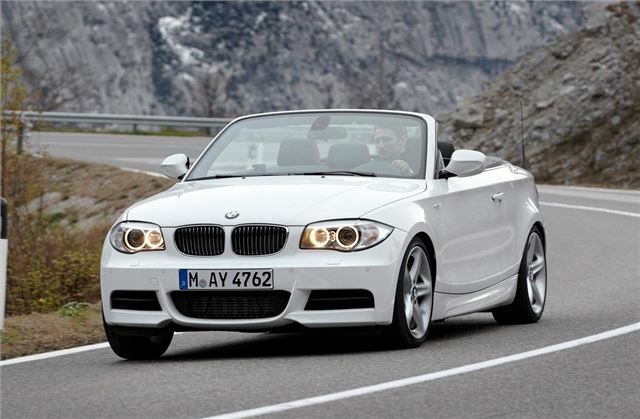 The new BMW 1 Series Coupe and Convertible go on sale March 2011, with prices starting from £21,960 OTR for the BMW 118d ES Coupé and £24,245 for the 118i ES Convertible.